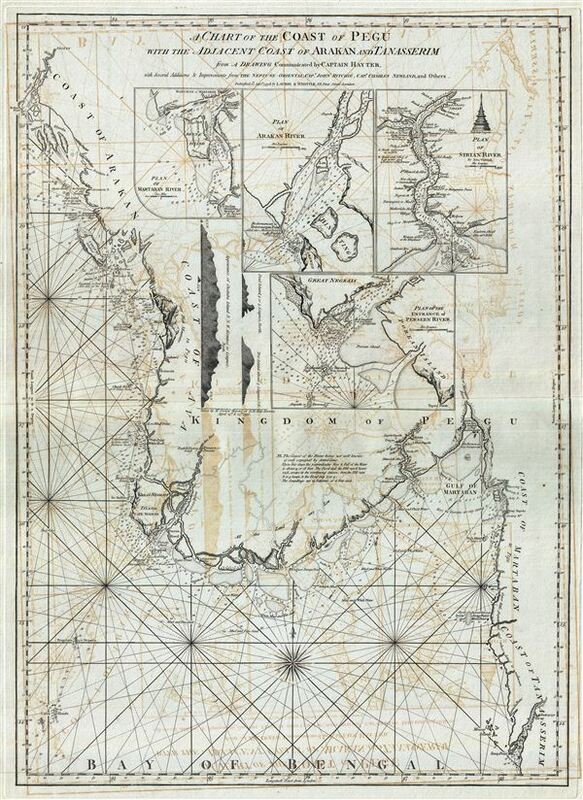 Scarce early nautical chart of Burma or Myanmar. A Chart of the Coast of Pegu with the Adjacent Coast of Arakan and Tanasserim. A fine example of Laurie and Whittle's 1798 nautical chart or maritime map of Burma, Myanmar, or as it was known in the 18th century, Pegu. The map covers the western extension of Southeast Asia from the city of Arakan (today the magnificent and almost impossible to access ruin of Mrauk-U), south along the coastline to the Irrawaddy River Delta, inland to Rangoon (Yangon, here identified as Dagon, for the awe inspiring Shwedagon Pagoda), and then south past the Gulf of Martaban (Mawlamyine), to the Kyan River and Tavay Point (formerly Victoria Point, currently Kawthaung, the Thailand-Myanmar border). The map offers rich detail including countless depth soundings, notes on the sea floor, commentary on reefs, rhumb lines, and a wealth of other practical information for the mariner. The interior is predominantly blank and annotations on the map clearly refer to a general lack of information regarding the region. Nonetheless, the 1748 site of an English factory on the Persain River (Currently Pathein, Myanmar) is identified and various inland river routes are tenuously ghosted in. Four large inset maps fill the empty space. These include a plan of the Martaban River (modern Mawlamyine) and the sacred Buddhist shrine at Quekmay (Kyaiktiyo), the precariously balanced Golden Rock Pagoda. Another map illustrating the Arakan River entrance, though the map does not continue inland as far as the city of Arakan, today's Mrauk-U. A third plan details the Sirian River, the modern Irrawaddy River, identifying the site of Rangoon (Yangon) as Dagon. A finally the fourth inset focuses on the entrance to the Perseen River, an important trade artery developed prior Rangoon and the site of an early British trading post at Pathein. To the left of the inset maps, there are three coastal profile views. This chart is cartographically derived from Jean-Baptiste d'Apres de Mannevillette's similar chart issued for the 1745 Neptune Oriental. It was twice reissued by Sayer and Bennet, and again, in this updated version by Laurie and Whittle, who acquired the Sayer and Bennet printing plates. The present Laurie and Whittle example is notable for several important updates by the British sea captains Hayter, Ritchie, and Newland. Laurie, R., and Whittle, J., The East-India Pilot, or Oriental Navigator, on One Hundred and Eighteen Plates: Containing a Complete Collection of Charts and Plans, &c., &c. for the Navigation not only of the Indian and China Seas, but of those also between England and the Cape of Good-Hope; Improved and Chiefly Composed from the Last Work of M. D'Apres de Mannevillette; with Considerable Additions, from Private Manuscripts of the Dutch, and from Draughts and Actual Surveys Communicated By Officers of the East-India Company A New Edition, Containing One Hundred and Five Charts. (London: Laurie and Whittle) 1798. Very good. Minor wear and verso repair along original centerfold. Original platemark visible. Some transference. National Library of Australia, 3666143; MAP Ra 52.